Keng Eng Kee Seafood is one of Singapore’s pre-eminent zi char authorities, recently earning international recognition in the form of a Michelin Plate. 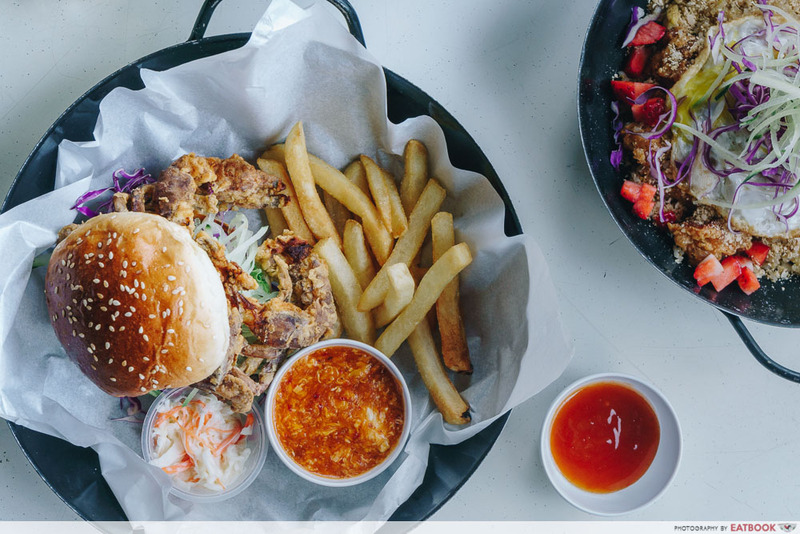 Building off their success, they opened Wok In Burger at the turn of the year, a separate stall next to their main Alexandra outlet, specialising in zi-char inspired burgers. 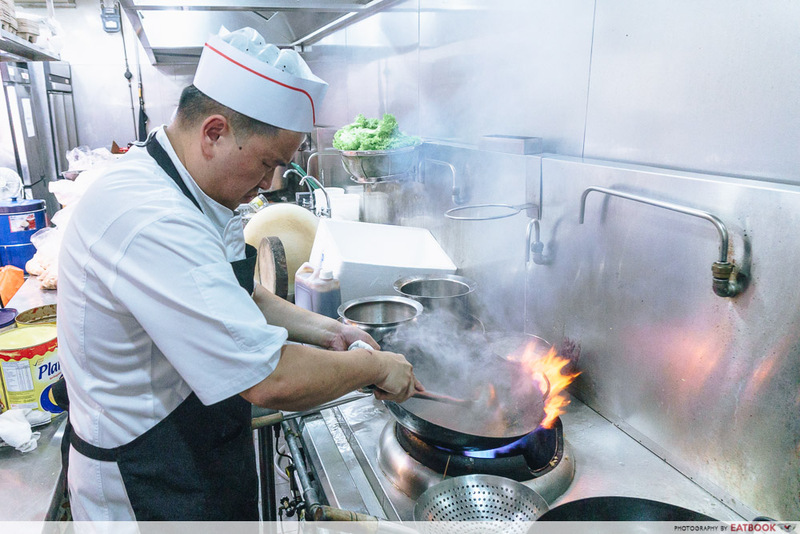 This unlikely venture has been in the “woks” for a while now, spawning from popular staff meals. As a fervent fan of their cuttlefish kang kong and other zi char classics, I made my way down, hopeful for fresh reinventions of local favourites. 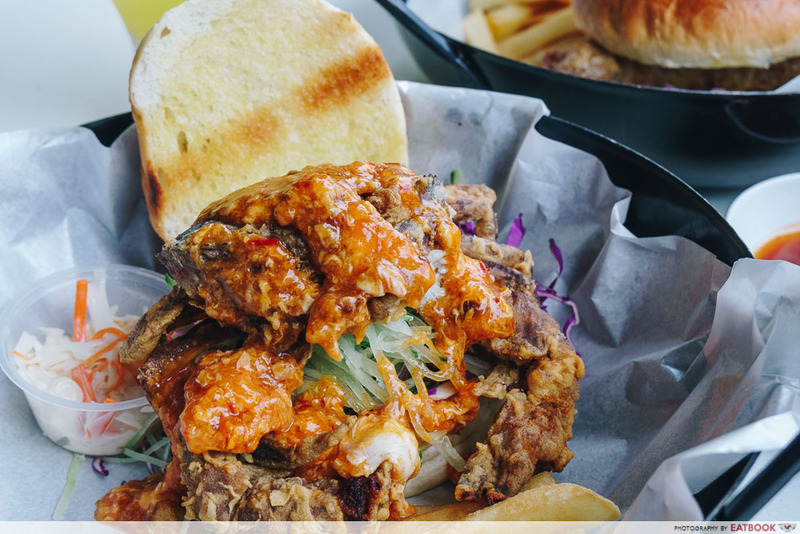 The bun on our Chilli Soft Shell Crab Burger ($15) could barely stay in place, struggling to contain the hulking crustacean that headlined this dish. Looking at it top-down, with its stocky legs hanging out of the burger, it was reminiscent of a tool Plankton would use to steal the Krabby Patty secret formula in SpongeBob SquarePants. However you try and iterate on chilli crab, it’s inevitably the sauce which makes or breaks the dish. Here, that integral sauce was served in a separate ramekin, in order to maintain the crab’s crisp batter. Freshness is clearly a priority, as each portion of sauce is prepared à la minute and served piping hot. We could taste the fruits of these labours as we chowed down on the burger. 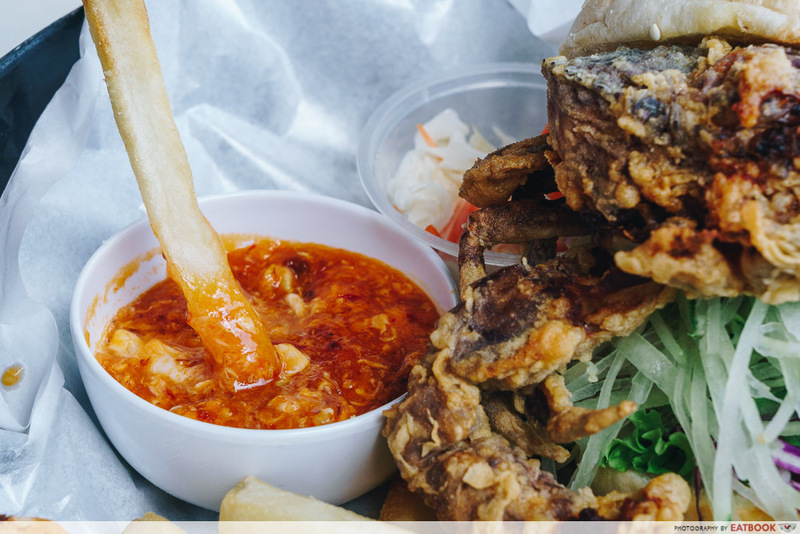 Soft-shell crabs – more so than other fried items – tend to get soggy and retain oil easily, but the ones here wasn’t overwhelmed with oil. It still held a crisp crunch too, despite the layer of viscous sauce drowning it. For me, Roland Restaurant’s chilli crab is the benchmark for this local seafood dish, and the sauce here was admittedly admirable. It was sweet without being cloying, and also carried a hint of crustacean flavour – an essential component of any good chilli crab sauce. The goopy gravy also served as a good companion for the chunky crab. Our faux patty had a creamy interior, and a briny yet fresh flavour, which was brightened up by the piquant sweet sauce. 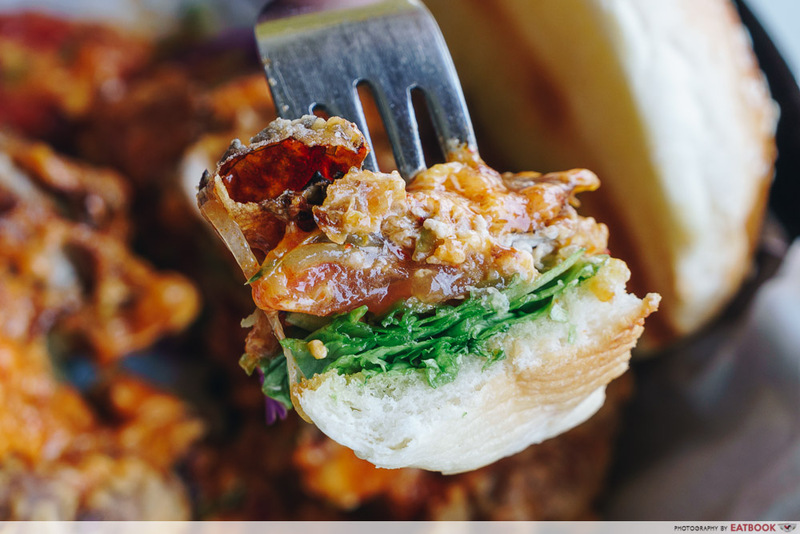 It’s imperative to eat this burger as fast as possible so that it doesn’t lose its crispiness. Wait too long and you’ll have a mouthful of soggy batter and limp buns. It showed as we approached the end of our meal, as the sauce soaked through our bread, leaving an oily film in our mouths. The danger with any fried burger is getting jelak from excess oil. 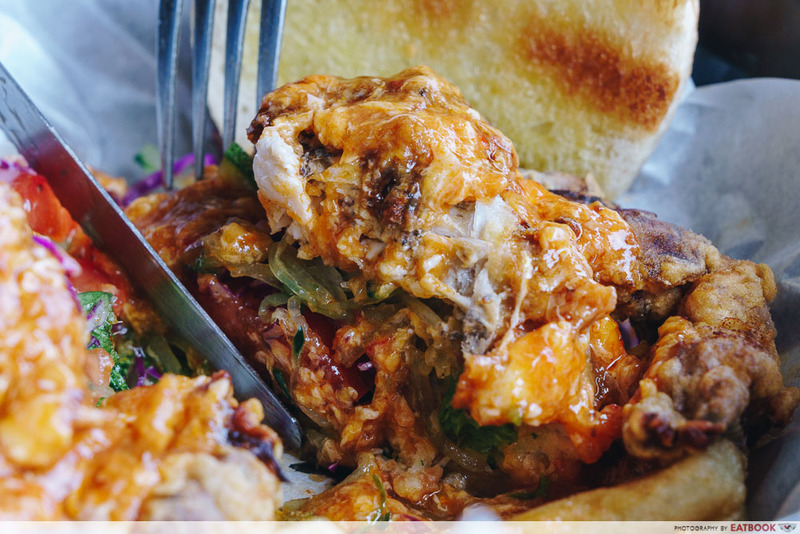 That’s why most fried chicken burgers come with some sort of slaw or relish. To some extent, that idea is emulated here too, with a garden of tomato, lettuce, as well as shredded cucumber and cabbage that gives a huge injection of freshness to counteract the fried crab. Lots of thought was clearly put into the construction and conceptualisation of this burger – from the toppings to how the sauce was served. The buns were no exception; lavishly buttered and toasted to provide a touch of richness. And yet, there was still something missing. Perhaps it was the overall sweet flavour profile imparted by the sauce and fresh tomato. 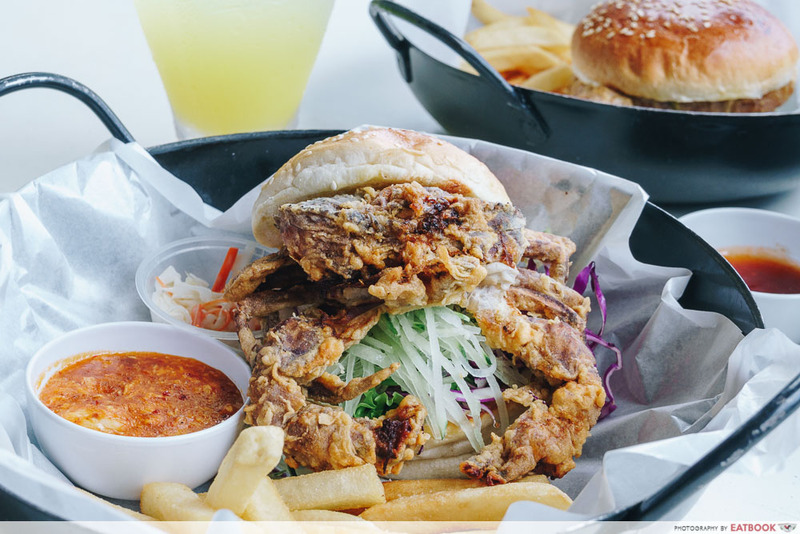 Or maybe I’m not accustomed to the lack of meatiness from a beef patty, which no soft-shell crab – no matter the size – can ever replicate. Whatever it is, I simply couldn’t shake the feeling that wolfing down this burger wasn’t quite as pleasurable as biting into a juicy mound of beef. In terms of sides, these fries were a rung up from the usual fast-food or hawker centre variety. Thick-cut and fluffy, they didn’t fall into the all-too-common trap of over-salting. Salted egg-coated meat and a miscellaneous carb – usually rice – is a tried and true combination. 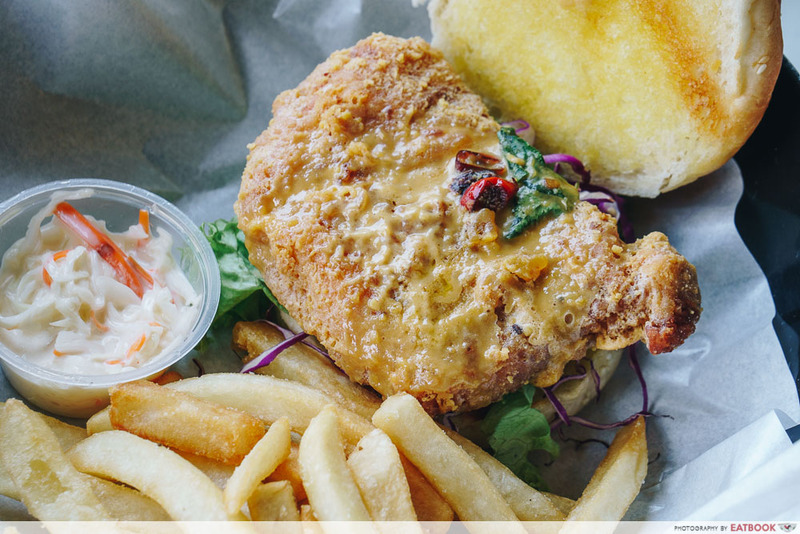 This Salted Egg Pork Burger ($9.80) tests that theory, replacing rice with buttered burger buns. Honestly, we weren’t hopeful on first glance. Unveiling the patty, only a paltry puddle of salted egg sauce was visible. As we sliced the thick disc of pork in half, our hopes weren’t buoyed, as traces of heavenly meat juice weren’t evident. Burgers need to have a lot of moisture from both sauce and patty to counterbalance the natural dryness of the buns. Looking at this burger, I had a tall drink at the ready to remedy a dehydrated mouth. Fortunately, our expectations were overturned. One of our key concerns was that salted egg wasn’t all too apparent in the burger’s outward appearance, but it’s familiar flavour flooded my palate from the first bite. The batter was utterly packed with salted egg taste, along with its familiar buddies – chilli padi and curry leaf. What made the biggest impression is how this burger managed to display its whole gamut of flavours individually, yet harmoniously. After being smacked with salted egg zing, curry leaf aroma and chilli heat, this trio of flavours quickly dissipated and was replaced by robust porkiness. Nothing jostled with, or overpowered the other. Instead, they took turns shining in the spotlight of our taste buds. Our second concern was a potentially dry pork chop. While it wasn’t exploding with juices like a medium-rare steak, it was sufficiently tender and never left a powdery mouthfeel. It was an unapologetic, big chunk of pork, and certainly provided the meatiness that we missed in our first burger. This burger had a similar field of greenery as its chilli crab cousin, sans cucumber. 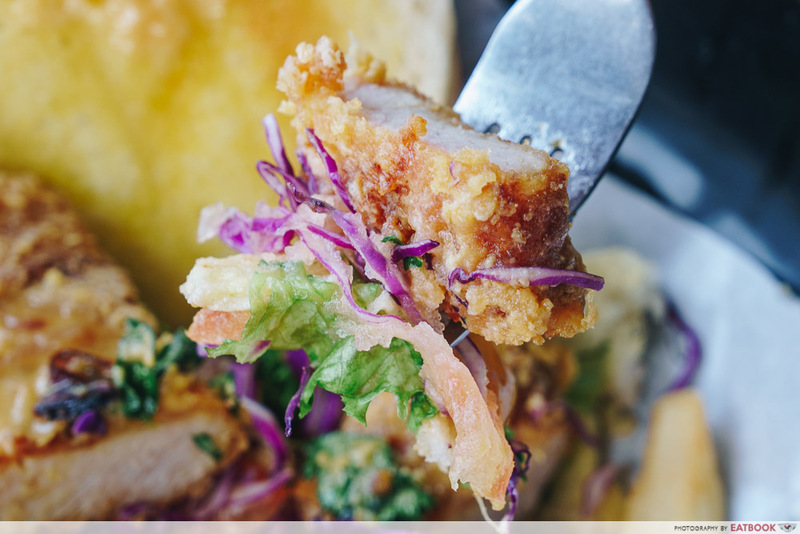 Again, they played a vital role, lending freshness, sweetness and moisture to battle the pork chop’s fried nature. If I were to compare the burger to a band, these buns were the low profile drummer in a hard rock band. With its slight char and buttered sensibilities, it formed a solid foundation for the other prominent flavours to take centre stage. 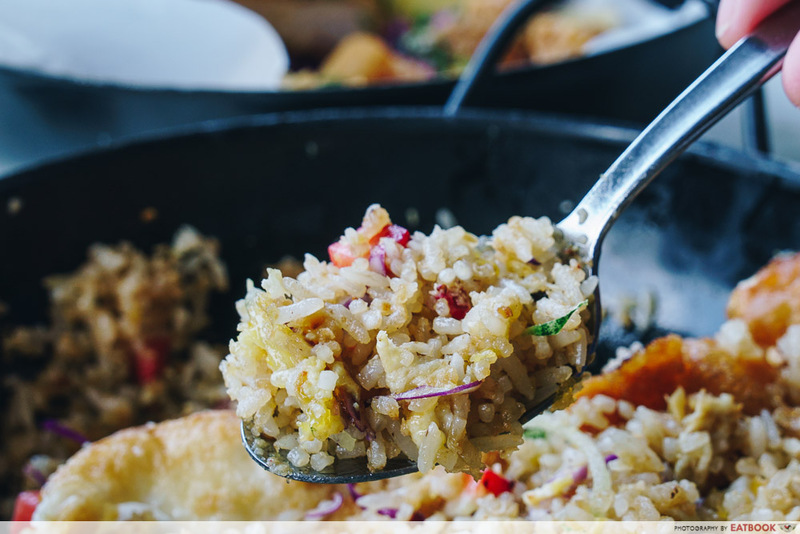 When we think of fried rice varieties, sambal, seafood and Yangzhou fried rice are probably what pops to mind. All of these are savoury. 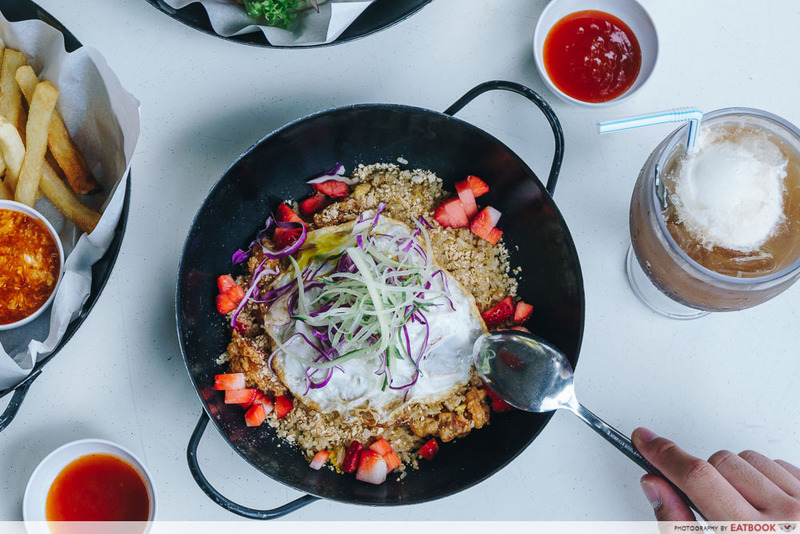 So needless to say the Strawberry Cereal Fried Rice ($8) sounds pretty contradictory, joining fellow confused luminaries such as Hawaiian pizza and dessert prata. For me, that isn’t a good sign, considering I find the latter two dishes blasphemous. 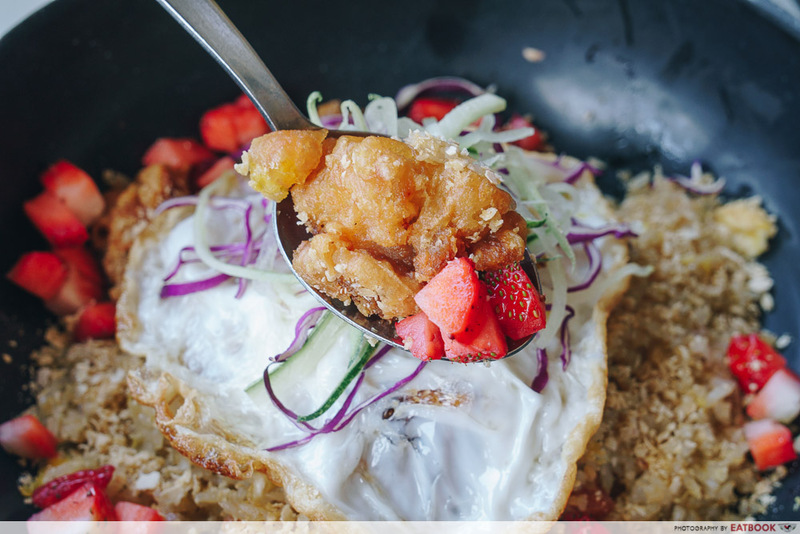 Freshly fried, this bowl of rice scented the air with a sweet sugary smell, characteristic of cereal prawns. In spite of its aroma and the odd inclusion of fruit, our fried rice thankfully remained firmly in the savoury camp. It was a solid, but unspectacular version of fried rice topped with cereal. As expected from a renowned zi char joint, all the basics were accomplished. Wok hei tinged each spoonful, while the rice grains had a good texture, straddling the line between mushy and dry. I wasn’t sure what to expect from the addition of strawberries, and after we finished, I wasn’t any closer to figuring it out. The strawberries weren’t particularly sweet, instead providing bursts of sourness and freshness. The decision to top the dish with strawberries, rather than include it in the fry-up was a double-edged sword. 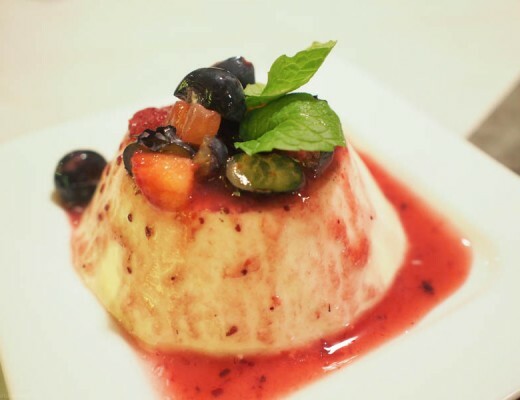 While they retained their freshness, it also meant strawberry flavour didn’t permeate the dish. When committing to a weird flavour combination, it’s probably best to go all-in. We expected more impact from this dish’s headline act, and in the end were left perplexed and mildly underwhelmed. Fried chicken chunks were another element dropped in to the wok. We appreciated their mild prawn paste flavour, which added fermented savouriness to our rice, but wished its skin possessed a crispier crackle. Shredded cucumber and cabbage are clearly a Wok In Burger favourite topping, making another guest appearance here. 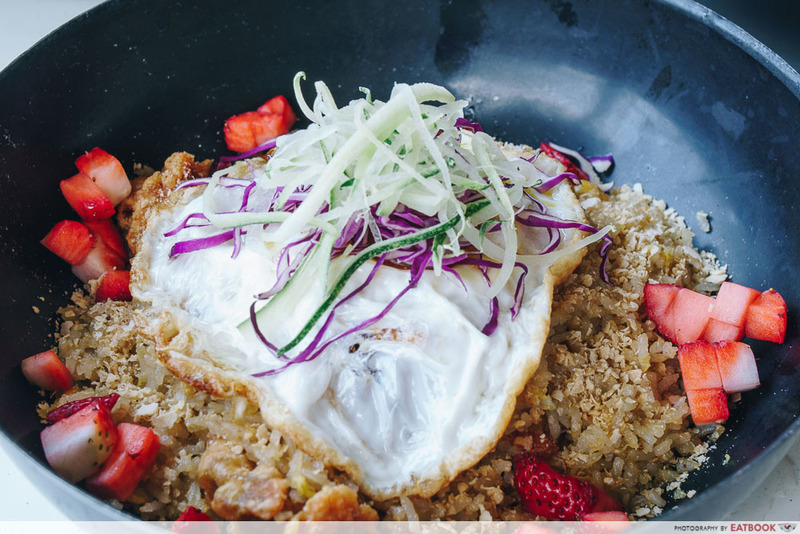 It’s effective, creating occasional parcels of freshness among the fried rice. Alongside a sunny-side up eg that bestowed a varied texture, attention-to-detail in terms of toppings again helped push this dish up a notch. Located adjacent to their main stall, this new addition to the Keng Eng Kee family is a nice option to spice up your nighttime zi char jaunts. 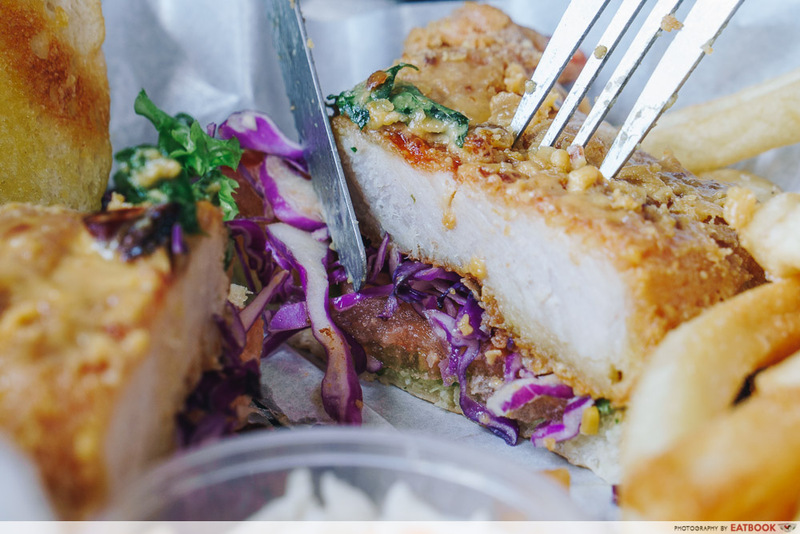 On outings with family and friends, consider trying out these nouveau creations while enjoying the OG stall’s zi char classics. Seating here is mostly classic coffee shop-style – open air but under shelter. However, there is a small air-conditioned section – mostly reserved for reservations – if you can’t stand sweating it out. 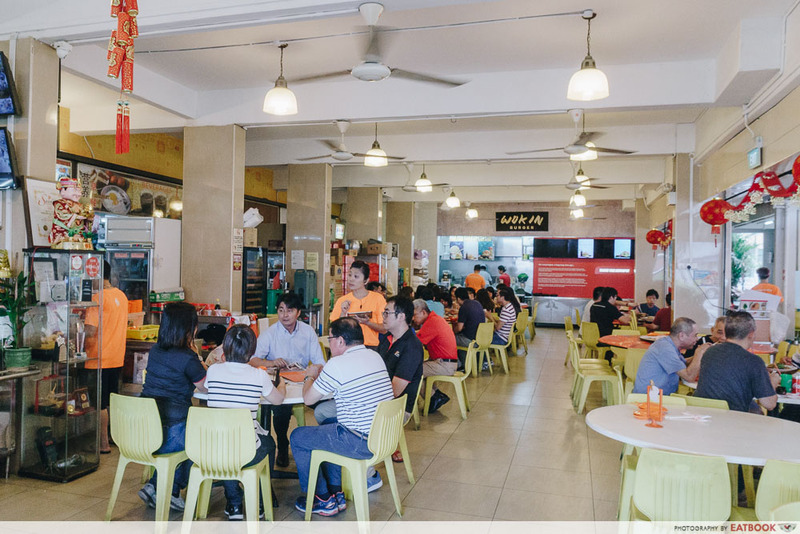 This is one of Singapore’s most famous zi char joints, so it’s a good idea to make a booking if you plan to make the trek down for a weekend dinner. 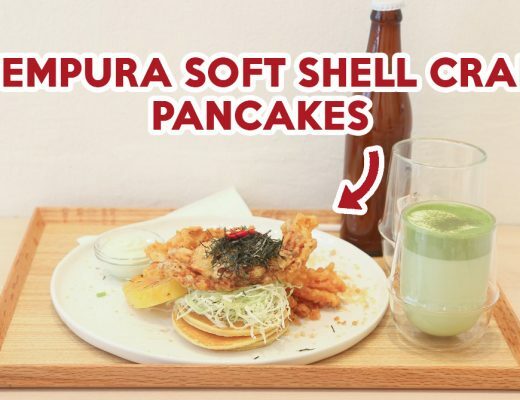 It’s refreshing to see traditional restaurants willing to experiment and evolve, crafting new dishes rather than resting on their laurels. When wanting to innovate on classic zi char dishes, it’s crucial to have a solid grasp on the base dish. 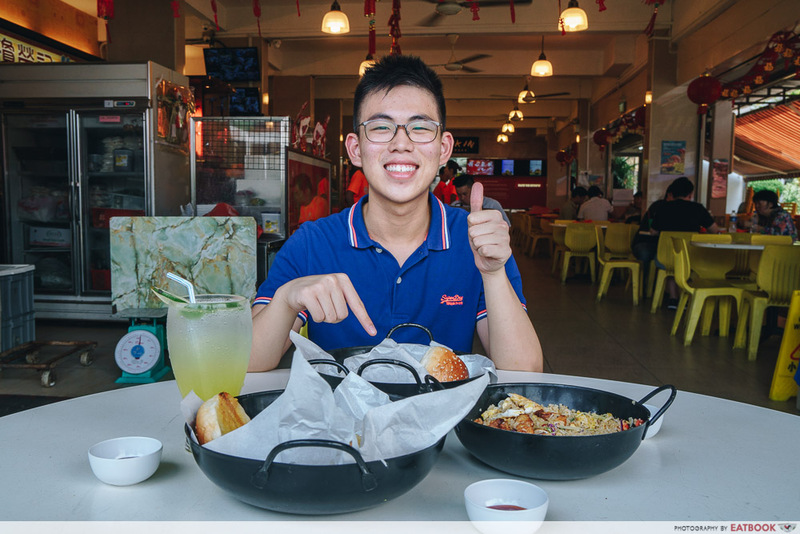 Thus, we hope to see more established zi char restaurants follow in Keng Eng Kee’s footsteps and use their traditional nous and credibility to give dishes a modern spin. 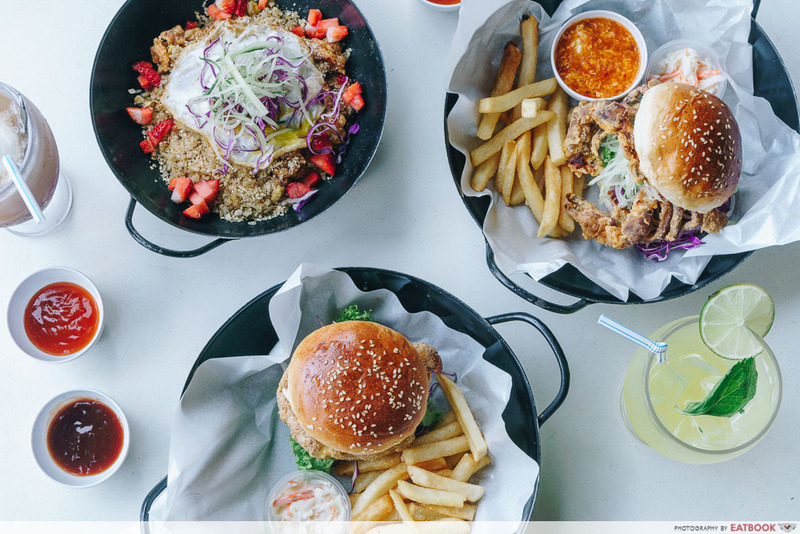 Invention and iteration is a lengthy process, and Wok In Burger doesn’t have it down pat yet, with some dishes not quite hitting the mark. However, there’s more than enough promise here for us to come back again to try more interesting creations. Find more blissful burgers for bun-based brunches with our reviews of Hammee’s and Ministry of Burgers. 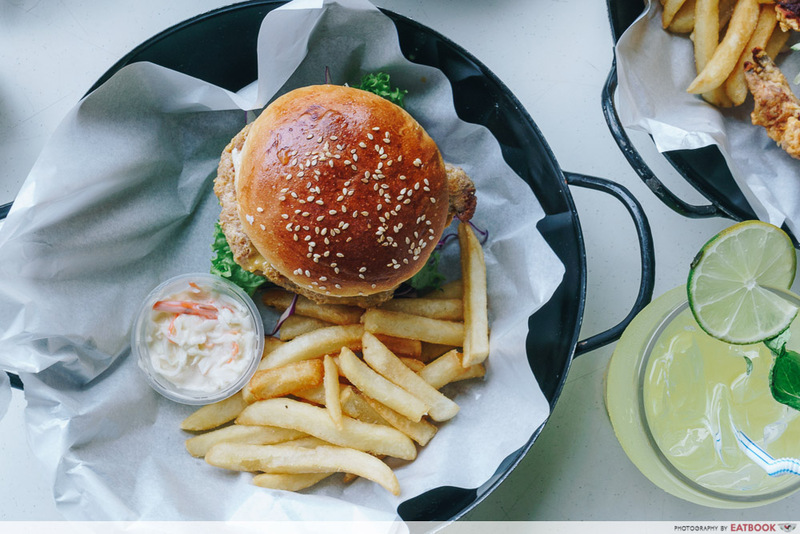 Let us know your favourite burger spots in the comments below! 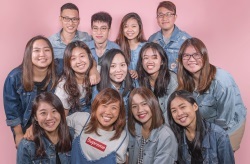 Photos taken by Pichan Cruz. 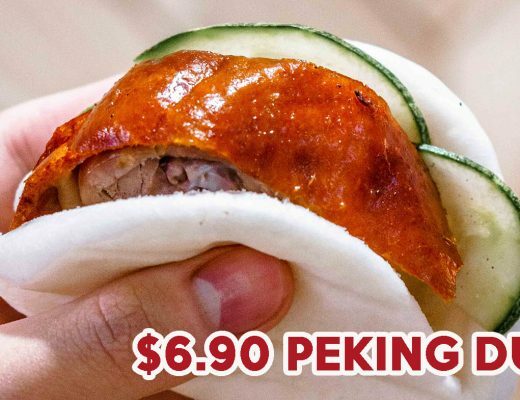 This is an independent review by Eatbook.